It was an honor to receive a special award from Keep Iowa Beautiful, which helps communities and organizations with cleanup and beautification projects while promoting anti-littering efforts. Keeping Iowa beautiful by cleaning up garbage and educating people about the damage caused by littering is important to economic development. It makes our state a more attractive place to live, work and invest. 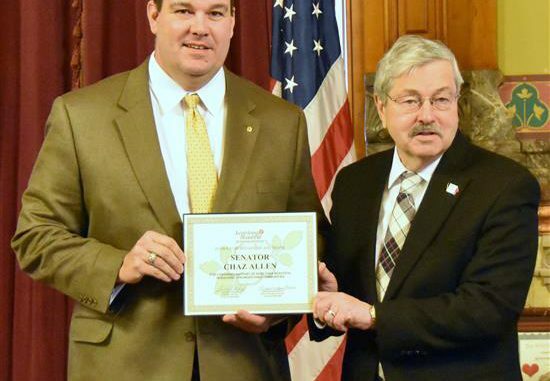 On Monday, March 13, Governor Terry Branstad presented Senator Chaz Allen with a special award from Keep Iowa Beautiful. The organization helps communities and organizations with cleanup and beautification projects while promoting anti-littering education programs. Senator Chaz Allen was recognized today for his leadership on a successful, bipartisan effort to continue state support of Keep Iowa Beautiful. In 2016, Allen worked with Iowa House Republican Pat Grassley to continue state support for Keep Iowa Beautiful.